Here’s one of my regular quick, filling & healthy lunches. I’ll give you today’s quantities & ingredients, but it really is down to whatever you happen to have available on any given day. The beauty of that is that you don’t get bored of it if you keep changing some of the ingredients. Today’s makes enough for 2 generous portions or 1 super-greedy portion (i.e. for me, it’s one portion!). Assuming 2 portions, it comes in at under 180kcals per portion! Although it’s not strictly-speaking low-fat, it is low-cal and full of GOOD fat in the form of extra virgin olive oil. Remember to use a really good quality extra virgin olive oil here, as you’re not using a lot of it, so it’s essential to get the best & strongest taste. Just throw all the ingredients into a large bowl, mix well and serve! 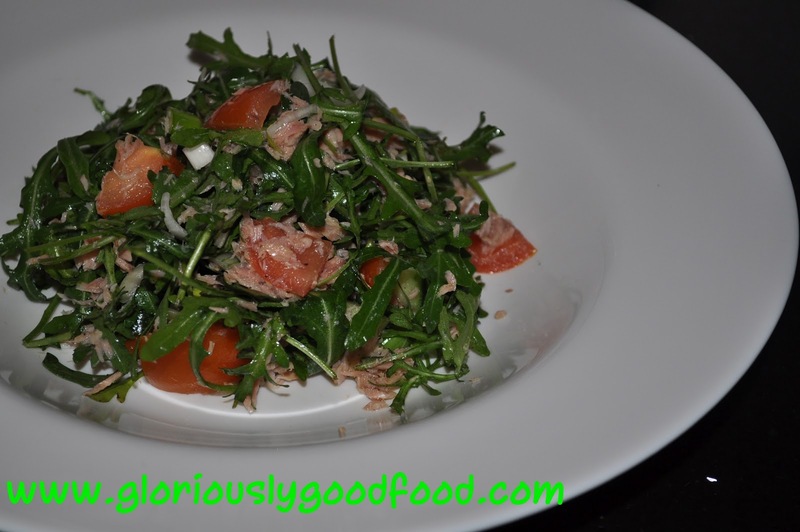 This entry was posted in Fish / Seafood, Low Fat / Low Cal and tagged extra virgin olive oil, low-cal lunch, low-cal salad, lunch ideas, olive oil, quick lunch, rocket, salad, tuna, tuna salad. Bookmark the permalink.